Our smallVOICE podcast is one! Our smallVOICE podcast has just notched up its 1st birthday! Thanks to everyone for listening and interacting. The podcast is a monthly mix of chat, reviews, live music and topical debate. 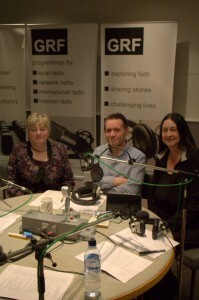 All the content is led by the experienced broadcasting team of Margaret Tooth, Darren McKinnon and Anne Muir (pictured above). You can listen to it on our dedicated website at www.smallvoice.org.uk or subscribe on iTunes and listen to it on your mp3 player or phone. We’ve had some great studio guests – including former Moderators of the General Assembly! There’s been laughs, great songs and challenging thoughts. You can let us know what you think about the podcast via the website or on Twitter (@small_voice1).